Judd Trump's maximum break of 147 at the German Masters is the 113th in snooker history and eighth of the 2014/15 season. 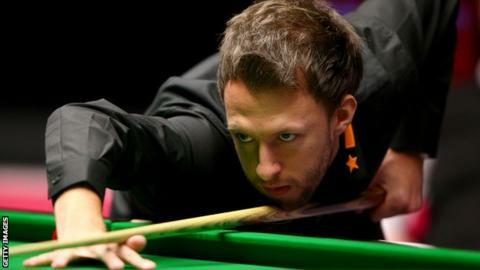 Judd Trump hit a maximum 147 break but lost to world champion Mark Selby in the last eight of the German Masters. Trump, last year's beaten finalist, made the second maximum of his career but lost the deciding ninth frame. Stephen Maguire will play Selby in the last four after beating Neil Robertson on the black in another 5-4 finish. Masters champion Shaun Murphy beat Ronnie O'Sullivan 5-4 to set up a semi-final with China's Liang Wenbo, who was also a 5-4 winner, over Ryan Day. Trump, whose previous maximum had also come against Selby in the 2013 Antwerp Open, recorded his 147 in frame five but was never in front against the world number four. World number 10 Murphy, who beat Robertson 10-2 to win the Masters last month, led O'Sullivan 2-0 before losing the next four frames with five-times world champion O'Sullivan making a 134 clearance in frame four. But Murphy - who also came down from 4-3 down to win his second-round game against Mark Allen - won the final three frames, clinching victory on the black after O'Sullivan had missed the final red. Murphy said: "Ronnie has given me some good beatings over the years so it's a reward for me and the hard work I have done to come out the right side of it." Welshman Day had knocked out defending champion Ding Junhui in round one but saw his tournament ended by Wenbo, with the world-ranked number 24 winning the final two frames with half-century breaks. Former world champion Robertson led Maguire 4-3 but the Scot levelled and then won the decider by one point on the black, after picking up a seven-point snooker, to complete the semi-final line-up.